(December 2, 2016) Forecasters are still uncertain about the timing and amount of snow we could get in the Portland area on Monday morning, but it never hurts to be prepared! 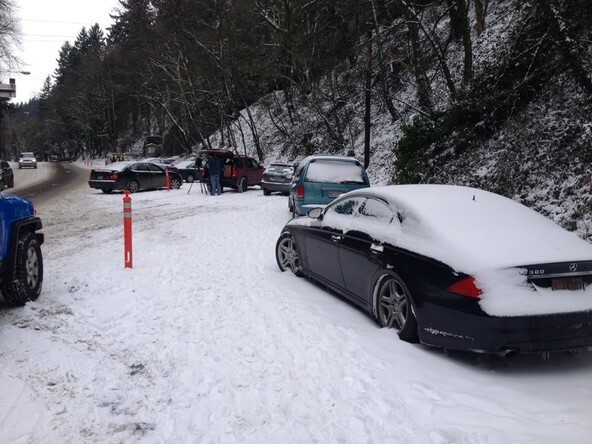 Safety is the Portland Bureau of Transportation's number one priority and, with that in mind, we've prepared some tips to make sure you get home safe in winter weather. Buy chains, practice putting them on your car, carry them in your vehicle, and use them. 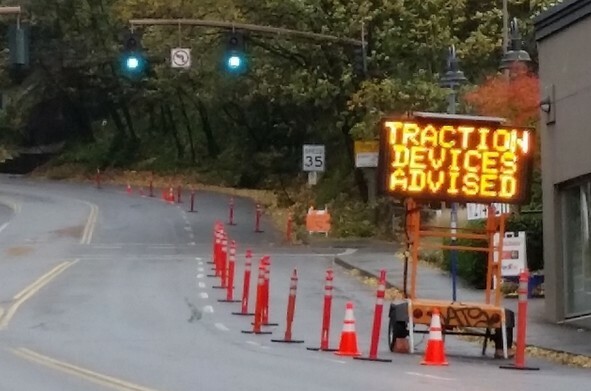 You may need them unexpectedly, especially at areas higher than 500 feet above sea level in Portland. PBOT sometimes requires chains or traction devices on West Burnside and SW Sam Jackson Parkway. Click here for an enlarged version of PBOT's Get Home Safe infographic. Black ice can occur when roadways are not subjected to direct sunlight in freezing temperatures. It looks "black" because it is clear, not frosty. This makes it almost invisible to the naked eye. Black ice commonly forms on roads that wind around lakes and rivers, in tunnels, on overpasses and in highly shaded, rural areas. Be especially careful when driving or riding into shaded areas, on bridges and overpasses, and on infrequently traveled roads. Slow down during your approach. If you choose to drive, stay with your vehicle in a snow and ice storm. Any abandoned vehicle is subject to being cited and impounded. To locate your vehicle, call Police Auto Records at 503-823-0044. If you are driving and visibility and conditions are getting worse rapidly, do not stop in a travel lane. Any vehicle creating a safety hazard is subject to towing. The current contractual cost of a tow is $168. The cost to store a towed vehicle past the initial four hours is $25 per day. If you get stuck in snow, do not spin your wheels. This will only dig you in deeper. Use a shovel to clear snow away from the wheels and the underside of the car. Pour sand, kitty litter, gravel, or de-icing granules in the path of the wheels to help get traction. Shift from forward to reverse, and back again. Each time you're in gear, give a light touch on the gas until the vehicle gets going. Stay warm and dry. For more visibility, wear bright clothing, an orange vest, or use reflective tape. Use front and rear bicycle lights. Lights are required by law when riding after dark - a white light visible at least 500 feet to the front, and a red light or reflector visible at least 600 feet to the rear. Brake early and often. Avoid some painted and steel road surfaces. Steel plates, sewer covers, grates and other metal can be very slick in the rain and snow. Stay out of puddles and off of black ice. Slow down, give yourself longer stopping distances, and keep a firmer grip on your handlebars. Remember, bicyclists have the right to take a full lane and/or use sidewalks which may be used if bike lanes are blocked by snow from snow plows. The City’s Snow and Ice Plan discourages private vehicle use and encourages mass transit use instead. In most Portland neighborhoods, residents are within four to six blocks of a transit stop or covered bus shelter. Some neighborhoods have great access to MAX light rail or the Portland Streetcar. To plan your commute by public transit, call 503-238-RIDE (7433) or visit www.TriMet.org for bus and MAX light rail schedules. In snow and ice, plan for bus delays of 20 to 30 minutes. Know where your transit stops are before venturing out.